Why wobble on a stability ball when you can improve your core strength and balance with the BOSU ball? David Weck invented the BOSU ball in 1999, and it looks like a stability ball cut in half. This design helps to add the X-factor that’s missing in your workout routine and gives amazing results in just three weeks’ time. Read on to know how the BOSU ball helps strengthen your core and the best 15 full body BOSU ball exercises and benefits. Swipe up! What Is A BOSU Ball And How Does It Work? BOSU (stands for BOth Sides Utilized) is a gym tool for building strength and stability. It has a flat surface and a hemisphere. The hemisphere is half-filled with air, which provides enough instability that prompts the recruitment of all the core muscles. And the flat surface provides stability to do the exercises with maximum precision. You can use both the flat surface and the hemisphere to strengthen the core and improve balance. Use it to do whole body exercises or just target specific problem areas. In fact, anyone can use it – beginners or pros. So, gear up and do some fun and effective exercises with the BOSU ball. These 15 best BOSU ball exercises are going to change the way you look at exercise. But before you start exercising, you must warm up for at least 10 minutes. Here’s how you can do an effective warm-up. Your muscles are prepped for the exercise now. Let’s get started! If you tend to accumulate fat on your lower body, these BOSU ball lower body exercises will help you. Target – Glutes, lower back, hamstrings, abs, and quads. Lie down on the floor. 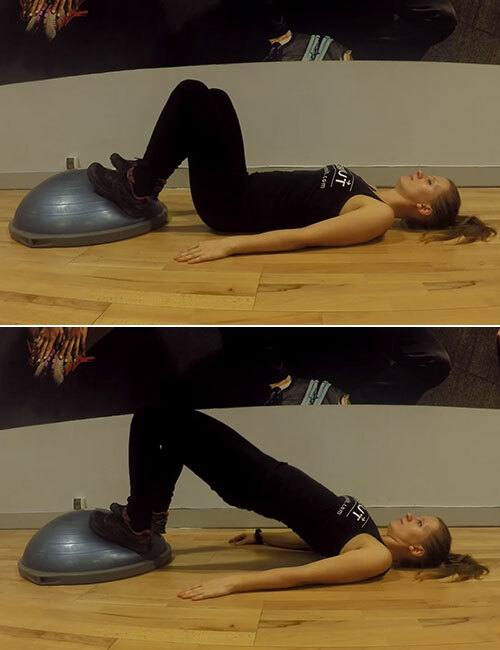 Flex your knees, and place your feet on the sides of the BOSU ball, as shown in the image. Place your arms by your side, palms flat on the floor, and look up at the ceiling. This is your starting position. Push your hips up toward the ceiling. Stop when your hips are in line with your thighs. Lower your hips but do not place them on the floor. Push your hips up again. To take this exercise to the advanced level, do the BOSU ball hip raises with one raised leg. Keep the knee of the raised leg slightly bent, push your hips up toward the ceiling, and lower the glutes. Do it with both legs raised. Target – Glutes, quads, hamstrings, and lower back. Place your BOSU ball on its hemisphere, i.e., the flat surface should be up. To avoid falling down, place your right leg on one side of the BOSU ball. The BOSU ball will tilt to the right. Then, place your left foot on the other side of the flat surface and balance. Make sure you are stable. This is the starting position. Push your hips back and flex your knees, lower your body, and bring your hands up near your chest. Make sure your knees are not overshooting your toes. Get back up to the starting position. Stand about a foot away from the BOSU ball. Keep your feet shoulder-width apart, core engaged, knees slightly bent, and chest out. The hemispherical surface of the BOSU ball should be up. Bend your knees slightly as a prep for jumping on the BOSU ball. Jump up and land on the hemispherical surface of the BOSU ball. Make sure you are in the squatting pose, your back is straight, and your knees are not overshooting your toes. Hold this pose for a moment and then get back up and jump back on the floor. As soon as your land on the floor, squat down. Target – Quads, hamstrings, calves, and glutes. Stand about a foot away from the BOSU ball. Keep your feet shoulder-width apart, core engaged, knees slightly bent, and chest out. The hemispherical surface of the BOSU ball should be up. This is the starting position. Place your right foot on top of the BOSU ball. Flex both the knees and lower your torso so that your thighs are perpendicular to your shins. Hold this pose for a moment and then step back again to the starting position. Step your right foot on top of the BOSU ball. Flex both the knees, lower your torso and lunge. Hold this pose for a moment and then step back again to the starting position. Do the same with your left leg on the BOSU ball. These are similar to side lunges and BOSU ball lunges. Stand beside the BOSU ball and put your right foot on the dome. Make sure your feet are at least 2-3 feet apart. Now, lunge to the right, get up, and lift your right leg off the BOSU ball dome and place it close to your left leg. Again, place your right leg on the dome and lunge. Target – Hip flexors, hamstrings, adductors, and glutes. Place your right foot on the floor beside the BOSU ball. Place your left foot behind you. So, now, you are basically lunging. Place your elbows on the BOSU ball and push your core down so that you are in a deep lunge. Hold this pose for 10 seconds to feel the stretch in your inner thighs, groin, and glutes. Release the stretch and repeat with the left leg. These exercises will help you tone your lower body. 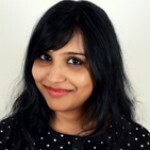 Now, let’s talk about one of the most problematic areas – the core. 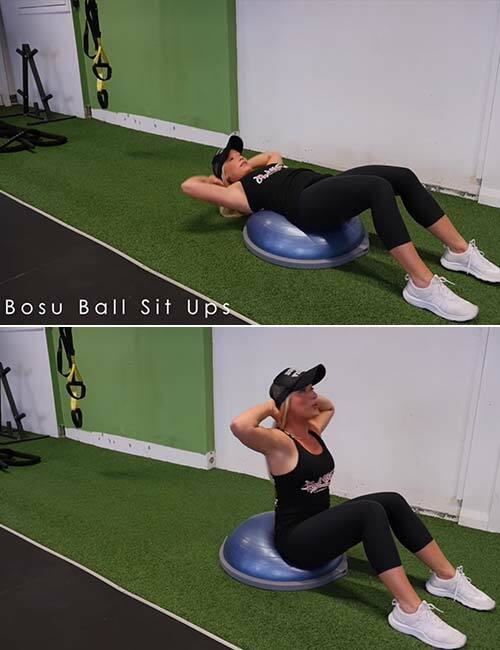 BOSU ball core strengthening and toning exercises help you get rid of the tummy pooch, love handles, and back fat and tone your shoulders, chest, and abs. Let’s get toning! Target – Upper abs, lower abs, and back. Sit on top of a BOSU ball. Place your palms on the BOSU ball and slide your buttocks down so that your hips are near the rim of the flat surface, and your entire back is against the dome of the ball. Keep your knees flexed and feet flat on the floor. Make sure your upper back is NOT against the dome of the ball. Place your thumb on the back of your ears and support your head with the other fingers. Open up your arms, and keep your core engaged. This is the starting position. Inhale and crunch up by lifting your upper body. Exhale as you crunch up. Inhale and go back to the starting position. Target – Obliques, upper back, and abs. Lie on your right side against the surface of the dome. Make sure the sides of your hips are at the lower part of the dome and the side of your chest on top of the dome. Flex your right elbow and place your right forearm on the BOSU ball. Place your left fingers on the back of your head, and open your left arm. Fold your right leg a bit and support your lower body by placing the inner side of the left leg on the floor. This is the starting position. Inhale and crunch back down to the starting position. Target – Abs, back, glutes, and shoulders. Flip over the BOSU ball, just like a turtle! Hold the BOSU ball at the edges as shown in the image. Extend your right leg behind you, flex your toes and place them on the floor. Extend your left leg behind you and support your body on the flexed toes of both the legs. Make sure your core is engaged, your spine is in line with your neck, and you are looking down. Hold this pose for 30-60 seconds. Kneel down in front of the BOSU ball. Place your elbows on top of the dome and clasp your palms together. Engage your core and extend your right leg and then your left leg behind you. Make sure your spine is in line with your neck and head. Look down. Hold this pose for 30-60 seconds. Keep breathing slowly. Release the plank pose and take 10 seconds rest. Target – Abs, glutes, shoulders, and upper back. Kneel down beside a BOSU ball such that it is on your left. Place your left palm on top of the dome and your right hand on your waist. Extend your right leg to the right. Keep your left leg folded. Extend your right hand straight up. Keep your core engaged and extend your left leg just behind your right leg so that your body is balanced and you don’t fall. Make sure your neck is in line with your spine. Hold this pose for 30 seconds. Sit on the dome of the BOSU ball and slide down a little. Place your thumbs behind your ears, support your head on the other fingers, open up your arms, and lie down. This is the starting position. Engage your core and lift your upper body and come to a sitting position. Exhale as you do so. These were BOSU ball exercises for your core. Now, let us talk about losing fat and toning up the upper body. Here are the exercises that you must do. Target – Triceps, shoulders, and biceps. Sit on the BOSU ball and place your hands on either side. Keep your knees flexed and feet flat on the floor. Lift your buttocks and support your body on your palms and feet. Keep your core engaged, and shoulders rolled back. This is the starting position. Lower your buttocks, and just when they are about to touch the floor, push up and come back to the starting position. Make sure your elbows are pointing backward and not to your sides. Target – Pectorals, lats, and shoulders. Hold a dumbbell in each hand and sit on the BOSU ball. Lie down on the dome, but make sure your upper back is not against the BOSU ball surface. Open your arms so that your palms are facing forward, and forearm is perpendicular to the upper arm. Look up at the ceiling and keep your core engaged. This is the starting position. Exhale and push the dumbbells up, extend your arms fully, and touch the heads of the dumbbells. Inhale and bring them back down. Target – Pectorals, deltoids, biceps, triceps, and core. Flip the BOSu ball so that the flat surface is up. Place your palms on both sides of the BOSU ball and grip the sides to stabilize it. Extend your legs behind you and keep your spine in line with your neck. Engage your core, inhale, flex your elbows, and lower your body until your chest is about to touch the flat surface of the BOSU ball. Exhale and push your body up back to the starting position. Target – Biceps, triceps, pectorals, lats, and deltoids. Place your right palm on top of the dome and left palm on the floor. Extend your legs back and come to a plank position. Inhale, flex your elbows, and lower your body. These were the 15 best BOSU ball exercises that you can do to tone your entire body or concentrate on one of your problem areas. Add this equipment to your exercise routine and gain strength and stability. And then, you can step up to stability ball exercises. BOSU ball exercises are the first step to take on the next fitness challenge. So, don’t be shy. Ask your trainer to help you. Buy a BOSU ball and start exercising at your home and see your physical fitness improve like never before. Take care! What is the meaning of BOSU? BOSU means both sides utilized, meaning you can use both the dome side and the flat surface to do various types of exercises. How many pounds is a BOSU ball? BOSU ball weights can range from 4 lbs to 350 lbs. Which BOSU model should I buy? Buy a retail or pro model depending on how much you are going to use it. Talk to your trainer to know the best option. How can a BOSU ball improve my core training exercises? BOSU ball adds instability to your core training. This instability helps recruit small muscle fibers of the core and makes the exercise more effective. How to use a BOSU ball to maintain my body balance? Practice standing up on the dome of the BOSU ball and doing small jogging motions to start building balance. You can take help of your trainer, a wall, or a chair and stand on the flat surface. The more you practice, the better you will get at maintaining your body balance. Medicine Ball Slam Workout – How To Do It & What Are Its Benefits? Heavy Bag Workout- What Is It And What Are Its Benefits?